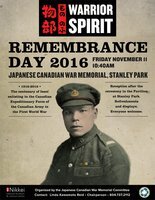 In 1916, over 220 Japanese Canadian volunteers finally enlisted in Alberta, when British Columbia blocked their opportunity to serve. This centenary year, we are acknowledging the honour, bravery, and leadership of these men, some who served with the Fighting Tenth Battalion, and made a significant impact in the taking of Vimy Ridge. Following the ceremony at the reception, Parks Canada and the Historic Sites and Monuments Board of Canada will be unveiling a plaque commemorating Japanese Canadian Soldiers of the First World War and the Fight to Win the Vote as an event of national historic significance. NNMCC . Last modified Oct 11 2016 11:05 a.m.